I thought a thread of discontinued, perhaps reformulated or renewed production of product would be worthwhile. Every so often a member finds a unicorn and web searches for information may be hit or miss. 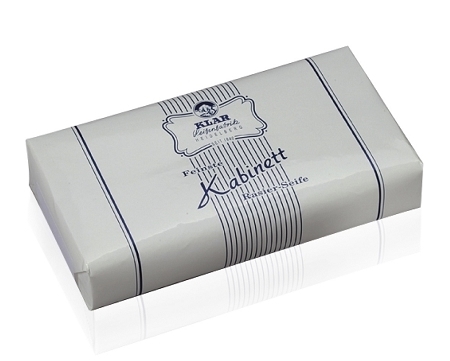 of professional barber's soap from Germany. Klars was discontinued @ 2012 and rapidly sold out; the SOP for products loved or never tried. Retail median was a low $16.38 to $20.00 when available. I remember one unopened block selling QUICKLY for $75 on another forum circa 2014. 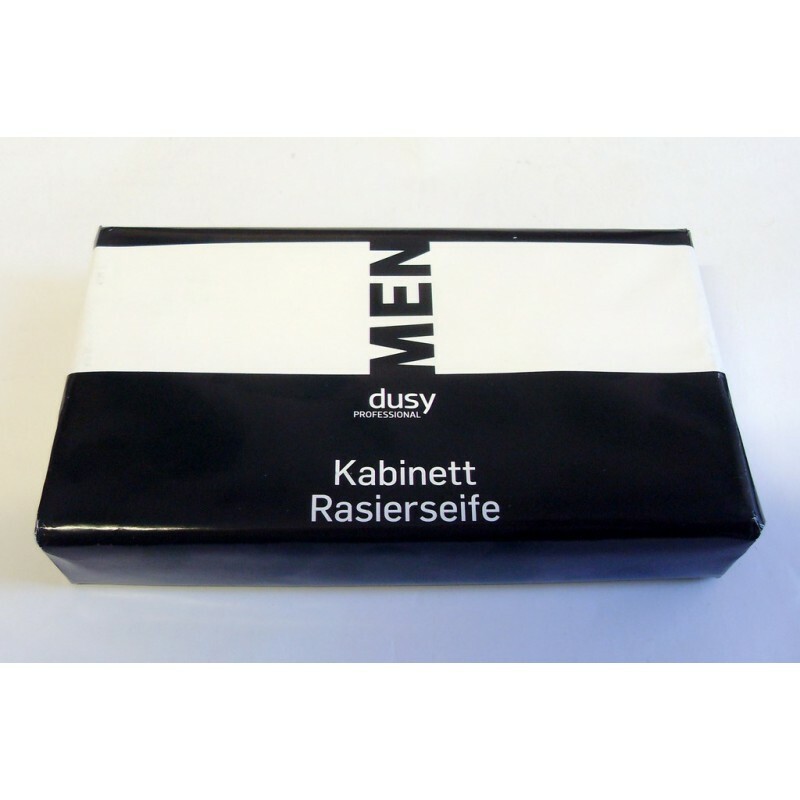 Then a rumored replacement in the form of Dusy was available; supposedly for the Czech market, rumored again to be a one time run and itself discontinued. It's NOT, but only sold in Germany for little more. I believe 21.38 euros last time I found the German website. They do not ship to the US and that would make it near prohibitive anyway. Performance reviews are neutral. It was a 'good soap' and the scent and large milled bars perhaps the selling point. Personally, and this is subjective: I love the stuff. The scent makes a marching shave SLOW almost to a military funeral procession- but far more lighthearted. I find this alone encourages attention to the shaving moment. There are some differences in formulation. I find no performanc difference. If chance brings either version to hand grab it. If you have contacts in Germany be nice to them; very, very nice. I hope others with a cherished product OOP will post. Oh, my title? Janis Joplin passed and everyone in my school was buying PEARL. I asked for it for my birthday. They were sold out, but my dear mother acquired my first encounter with a REFORMULATED product. Some CW singer; cotton candy hair, fluffy dress who could have been a singer with THE GOOD OLD BOYS ( THE BLUES BROTHERS) rushed her version out and mom bought it instead. I think all the sugar from her hair dripped onto her vocal cords and I threw it out and caught hell for the $2.99 AND sales tax. I've been thinking a lot recently about the Green Pond Sandalwood cream. A variation of the DR Harris cream but slightly different. I loved that cream. Rooney Heritage XL series two bands. The 'gel tips.' Still own them but wish I had backups their that good. Sabini's nicest hair imo. Houbigant Fougere Royale would be my software unicorn, both the soap and the cologne. Ralph Lauren's Safari soap another. But I'll definitely look up that German shop for some of that Kabinett. I can Google, but if you have the name of it, KAV...? My last unopened brick of Klar. I am going to miss it as the supply in a IKEA Grundtal get closer to the botton after every use. (05-12-2017, 06:29 AM)vtmax Wrote: Rooney Heritage XL series two bands. The 'gel tips.' Still own them but wish I had backups their that good. Sabini's nicest hair imo. 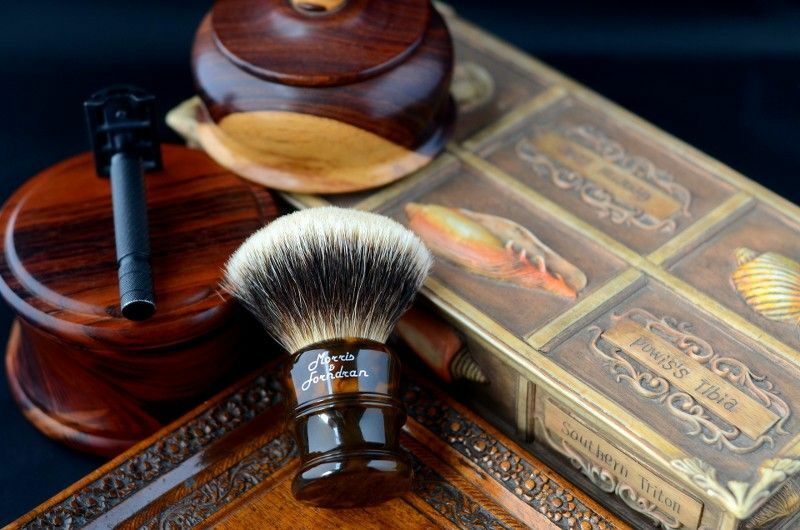 Sabini's older Heritage hair, in any of his brushes, was superb! The knot I have in my 3XL Tortoise is an example of the best constructed shaving brush knots you'll ever find. I have no idea if he was the source of the construction or not, but whomever was did a fabulous job. Furthermore, many of Sabini's older knots (2011-2012 and earlier) in any form were incredible and I wish I had kept the ones I sold off, earlier on. 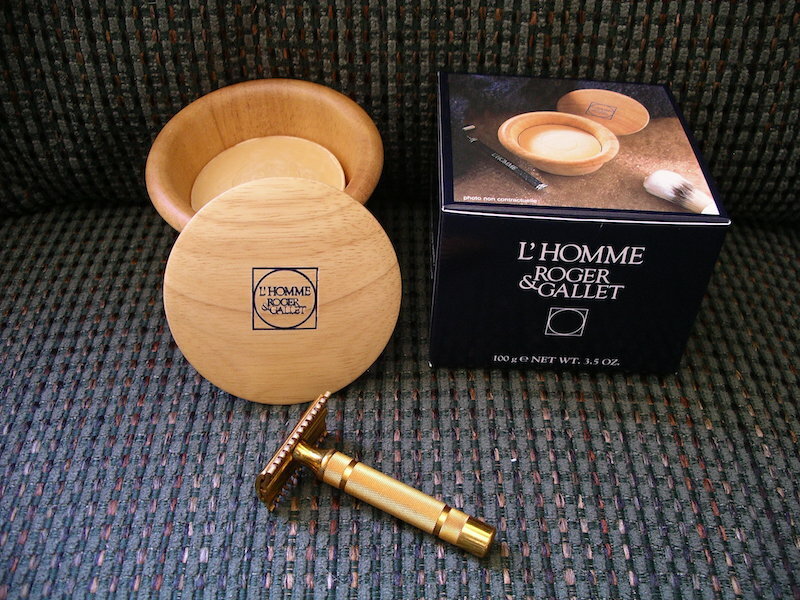 The original Roger & Gallet L'Homme Shaving Soap. This hard milled soap produced a beautiful lather and I loved the scent. 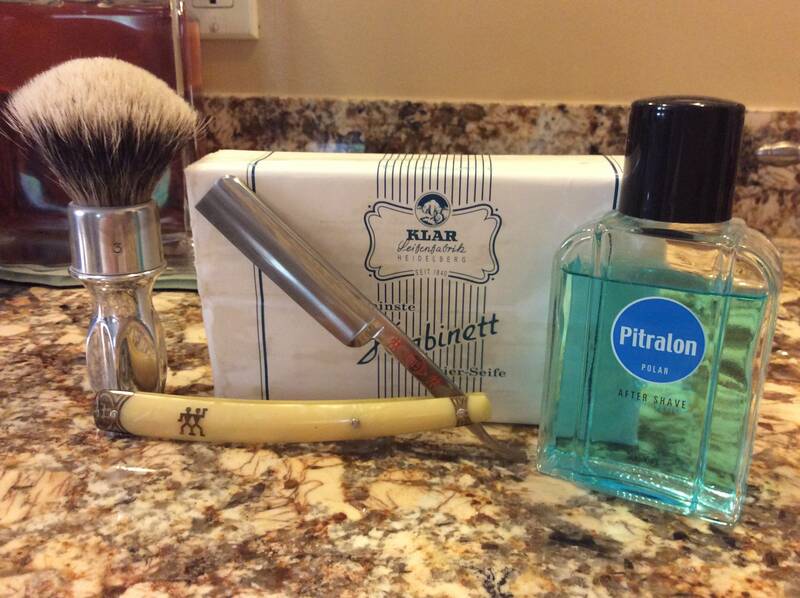 I still have some of the shaving balm and eau de toilette, which I enjoy using. I committed the one mistake I hate watching shaving videos. I HAD the Dusy maker's website, neglected to post it and deleted my search history last night in case any federal agencies bust in and seize my laptop. I will find it today. Now, looking for it briefly I gleaned another fact. There is a small symbol of a opened puck container with 9M. This is apparently a European symbol indicating use within 9 months. I found one for 12 on my Pre de Provence and 36 MWF. Seeing as the packaging is rather ephemeral paper should I be considering a vacuum repackaging? I would rather use a product than let it degrade. Or, will the products outlast these cautionary periods? Celestino, I just presumed it was Sabini as he was quite active during that period but who really knows! I love how they hold and release lather. Beautiful brush. Mine are the standard ivory 1,2,&3 xl's. Kav, funny I've never looked but don't remember seeing 9 months before. Interesting as I only notice12 & 36 as you mentioned.